One of the many things I admire about Teilhard de Chardin is that, despite all his numerous struggles (e.g. horrific carnage of WWI, early death of multiple siblings, exile to China and censorship by religious authorities), he seemed to have a magnetic joy and optimism. “[J]oy is a key indicator of a healthy spirituality. 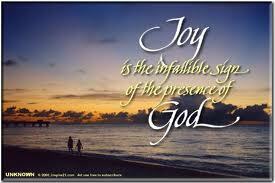 Joy, in its classic sense, is not a synonym for happiness, but instead refers to zest for life. You can have an underlying zest for life whether you are happy or whether you are sad. True joy never involves avoiding reality. It means facing it head on–not just the bad, not just the good, but all of it, without fear. In fact, from a Christian perspective, because joy is based in a deep appreciation of the goodness and wonder of God and God’s creation, it is naturally accompanied by hope, no matter how bleak things may look to others. A joyful person weeps at tragedy, but does not dwell long in grief, and does not despair. A joyful person smiles when things are going well, but does not forget to be grateful. And a joyful person laughs–laughs at jokes, laughs with delight, and perhaps most of all laughs when recognizing his or her own foibles and delusions of grandeur. This entry was posted in Teilhard Quote of the Week and tagged Christian, David Backes, joy, teilhard, teilhard de chardin. Bookmark the permalink. Thanks for your post, I find it very inspiring the message of Pierre Teilhard de Chardin about Joy and I agree with that very much. Also I found very surprisring you post this article on 27 May 2013 which is the day my son was born, the day my Joy has joined me.